SPF Yourself: LAVANILA The Healthy Sun Screen SPF 30. SPF Yourself is a series of posts featuring products that contain a sunscreen, or SPF, in them. Not only sunscreens, but body lotions, facial moisturizers, eye creams, foundations, tinted moisturizers, bronzers, hair care and more will be featured. Only the best in beauty with SPF! I have added a new step to my routine this summer, which I hope to continue all year long. I have been slathering my entire body with sunscreen, no matter if I am about to head outside or not, every morning. Finding one that is not heavy or smells like the tropics isn't as easy as you would think. I started using LAVANILA The Healthy Sun Screen SPF 30 Body Cream after my shower and my skin is thanking me for it. Not only does my skin feel smooth, it is protected with the new generation of mineral sunscreens. Made with an ultra-nourishing blend of antioxidant-rich green tea, soothing cucumber and organic shea butter, this non-greasy and non-whitening block delivers the ultimate in hydrating sun protection. Lavanila’s Healthy Sunscreen is 100% natural and made with mineral sunscreens for superior UVA/UVB protection. Completely free of harsh chemicals, all formulas are fragrance-free and infused with a superior complex of skin-saving vitamins, minerals, and amino acids. 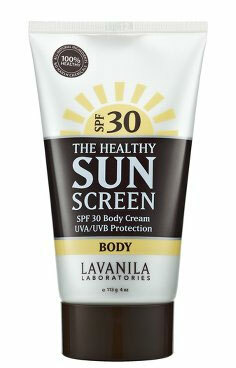 LAVANILA The Healthy Sun Screen SPF 30 Body Cream sells for $38.00 at Sephora. Beauty + Good = Clarins FEED Bag.